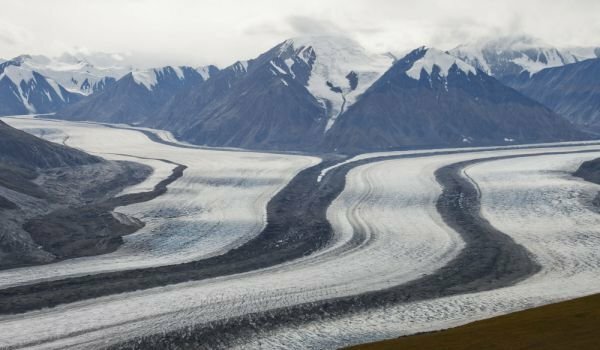 Kaskawulsh Glacier is one of the natural wonders of the Kluane National Park in the Canadian province of Yukon. The majestic ice field and its pointed white hills are one of the most popular and photographed sights in the park. Kaskawulsh is a constantly changing glacier, which depends entirely on climate change. Kaskawulsh glacier is situated at 2000-3000 meters altitude. It reaches a length of 350 km from the Alsek River to the Chugach mountains. The Glacier itself consists of two separate glaciers, called the Central and North. The central arm of Kaskawulsh in turn is composed of many small glaciers and its overall width is about 3, 5 km. Northern side is about 2 km wide, making the total width of Kaskawulsh amounting to about 5-6 km. The majestic Kaskawulsh field covers an area of 25, 000 sq. km. It spreads from the northeast slope of the St. Elias Mountains. Kaskawulsh melts slowly and significantly influences the level of Lake Kluane, which is powered by its melting. Extending some 70 km, lake Kluane is the largest in the park. It drains to the north, by the Yukon River. Today, about 80% of the glacier waters of Kaskawulsh go north through the Slims River and reaches the lake Kluane. The remaining 20% Kaskawulsh feed a river that goes east and south, and then joins the Alsek River, flowing into the Pacific Ocean. Alarming statistics exist, related to the constantly changing level of Lake Kluane. To the observation points of the glacier Kaskawulsh are organized regular tours, lasting one or 3 days.